Everyone wants more joy in their life, right? But the big question is how do we get it. 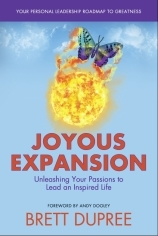 In Brett Dupree’s Joyous Expansion you will find the answers. I have never read anywhere so much uniqueness in finding the joy within. As I got about two thirds of the way through his book, I thought to myself, “He has written so much. What else can he say?” And in each new section, there was more and more wisdom. I got surprised over and over again with more ideas on living an inspired life, all of which, were presented in a clear and concise way. For someone so young to have so much wisdom is scary. His way of having you set your intentions is so unique and powerful. I have never read such a precise and effective way of wording them. And I have read a lot about using affirmations and setting goals. I believe you will feel uplifted just by reading this book even without doing any of the work. So even if you don’t do any of the exercises in the book, please give it a read as Brett’s writing style is just so full of inspiration. Like I said you will be inspired just from the reading of it but if you choose to do the work, you cannot help but expand the joy in your life. As always, the challenge is to take action. So, if you want happiness and joy in your life, read Brett’s book and then take the actions found there. It will be the start of an amazing journey of living your life to the fullest and with the greatest amount of joy.